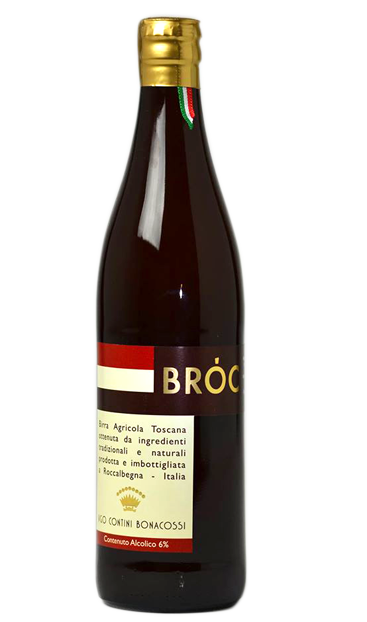 BRÓC is a Tuscan agricultural beer of artisanal craftsmanship that is distinguished from the majority of beers present on the market today for the quality of raw materials used. The concept of agricultural beer is linked in part to its production ‘in-house’ – at least 75% of the barley and wheat used is grown directly on our Bio Agricert-certified estate – and in part to the benefits of a zero km supply chain. Just as importantly, however, it is linked to the act of love towards the Roccalbegna land itself, a small town in the province of Grosseto on the border between the Grosseto Maremma and Amiata territory. These are places where time seems to have stood still and where the hand of man has remained that of a farmer, safeguarding the purity of the terrain, the aquifers and the air. BRÓC is a lightly spiced high fermentation beer produced with malted barley and malted wheat that recalls the style of the ancient Belgian abbeys. It has a moderate hoppiness that is obtained using the best European hops, in contrast to recent trends for decidedly bitter beers. Even the water used plays an important part: situated at 522 metres above sea level, Roccalbegna enjoys general water supply of optimal quality. From an initial sugar content of 16.8 degrees Plato, the beer arrives at a final 6% ABV. The low attenuation yeast used means that the beer has a good sugar residue and therefore both a sweet taste and a full body. Being bottle conditioned, the beer is not made in a watery style. Body and roundness are imparted by the yeast present in the bottle, where the process of refermentation occurs after a brief first spell in the cellar. The beer does not undergo any pasteurisation or microfiltration treatment and we advise pouring the yeast remaining in the bottle into the glass to fully take advantage of the olfactory, nutritional and organoleptic qualities of the final product. Of an intense golden, opalescent colour, the beer has a creamy and persistent head. On the nose it has delicate aromas of white-fleshed fruit and breadcrust. Mellow yet bold on the palate, it has a velvety and substantial mouthfeel and enduring carbonation. Notes of caramel and liquorice are interwoven with ripe fruit and yeast flavours. Charcuterie boards and semi-aged (semi stagionati) pecorino cheeses accompanied by honeys and/or fruit/vegetable compôtes; first course dishes seasoned al tartufo or with other bold flavours, grilled meat or fish. Ideal if paired with itself! The beer forms a natural yeast-rich sediment that can be poured and enjoyed if desired. 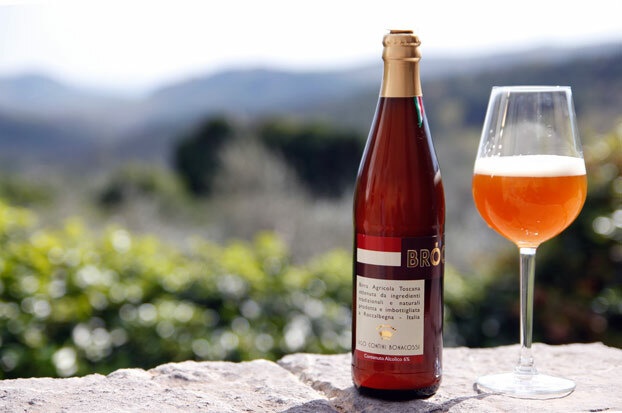 Our friend Ugo Contini Bonacossi is producing agricultural beer in Roccalbegna that stands out, happily, for its quality. Amber in colour, not clear due to it being unfiltered, a persistent head. Delicate nose of white-fleshed fruit and breadcrust. Mellow yet bold on the palate, velvety and substantial mouthfeel, enduring carbonation. Caramel and liquorice notes against ripe fruit and yeast flavours. Bravo! A 500ml bottle to share… the choice of format is to encourage enjoying the beer in company, creating relationships. It is an ideal beer to enjoy together and its sweet character makes it a perfect choice for those with a sweeter palate. Contact us to purchase our beer!